Like I said, I am such a homer when it comes to sport. I became aware of the game of hockey on my birthday in December of 1992 when I met Mike Modano at a grocery store appearance. He was fresh off the plane from Minnesota in town for the press conference that announced the Minnesota North Stars would be moving to Dallas, Texas for the 93-94 season. It was quite the scandal because at that time there were no southern states with a hockey franchise. The hockey purest said there was no way hockey would be successful in Texas. It was to damn hot. They were so wrong. 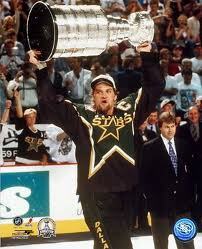 In 1999, in the 3rd sudden death overtime the Stars won the Stanley Cup Finals. The game ended at 2:00 am and I watched every second of it. 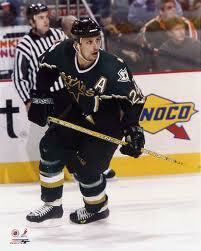 I, along with the rest of the metroplex was hooked and a Stars fan for life. 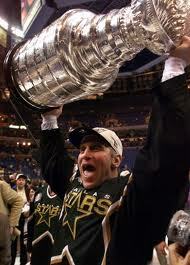 My favorite hockey player is still Brett Hull. Are you a hockey fan? I totally remember the media going on and on about how they wouldn’t last a year. Shows you how much they know! I’m a huge hockey fan and a diehard NY Islanders fan. There’s nothing more exciting or adrenaline pumping than watching your team win a big game, whether you’re at the arena or not. Looking forward to this years playoffs!! Go Isles!! Yes I am! Hockey can exist anywhere there are fans and an ice rink. Ironic to think that there are only a couple teams left in Canada now. They’ve all moved to the US. My dad used to take me to Hockey games when I was younger. I loved watching the people more than the game. I have to confess that I don’t watch hockey, but over the holidays, I ate at a restaurant with my husband that was adjacent to an ice rink. So we got to watch the players practice during our dinner. Love hockey! Much better watching live than on tv. My son played for about 10 years – all different levels. Very fun times.